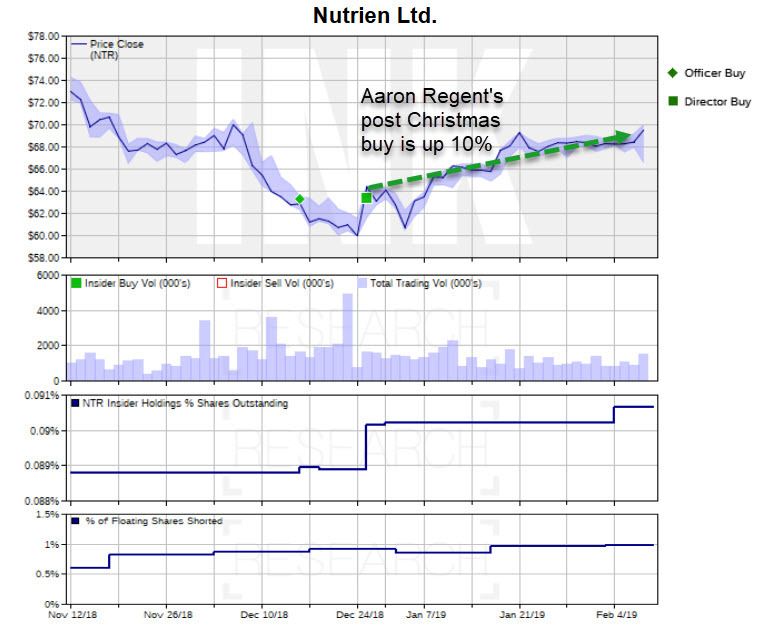 Former Barrick Gold (Mostly Sunny; ABX) CEO and current Nutrien (Mostly Sunny; NTR) director Aaron Regent made a half million dollar bet on Nutrien stock December 27th. That investment is already up almost 10% in just 6 weeks. The returns were helped Thursday when the agricultural chemicals stock jumped 1.6% after the company reported Q4 results. Although the quarter, which generated US$0.54 cents in adjusted earnings, missed the Investing.com consensus of $US0.56, investors cheered 2019 guidance. The company's midpoint expectation for adjusted full-year EPS is US$3.00, up from 2018 reported adjusted EPS of $US2.69. 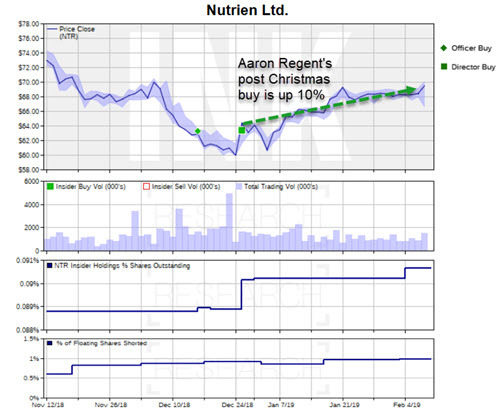 On the same day as his Nutrien purchase, Mr. Regent also boosted his stake in the Bank of Nova Scotia (Mostly Sunny; BNS) where he is also a director. That trade was also worth about half a million dollars and is also up about 10%. The BNS will report Q1 earnings on February 26th. While Mr. Regent's recent insider purchases are in the soft areas of agriculture and financials, he has not given up on the hard asset world of mining by any stretch. 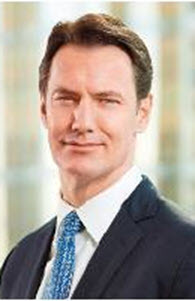 He is currently the CEO of Niobec Inc., a privately held niobium mining company located in Quebec. 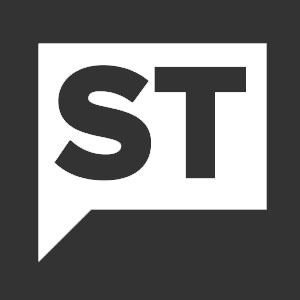 This post first appeared on INKResearch.com. Insights: Glass half full or half empty?